We are hosting a Cajun Cooking Class with a New Orleans menu. The theme of the menu is shrimp but color and balance are very important. When you're dealing with Southern food, a lot of times it can be quite dark or all similar colors so a lot of times I try to make it more vibrant. In America, the Shrimp Creole is a meal in itself. We eat it with rice and french bread but that's very carb heavy. Here in Japan, you want to bring something lighter so I decided to make it a side dish rather than the main and instead let the Po'Boy be the star as it's very popular here in Japan. The Po'Boy is still just a sandwich, so I decided to make it a smaller Po'boy and the Shrimp Creole as a side to eat with some Grit Cakes - using polenta instead. 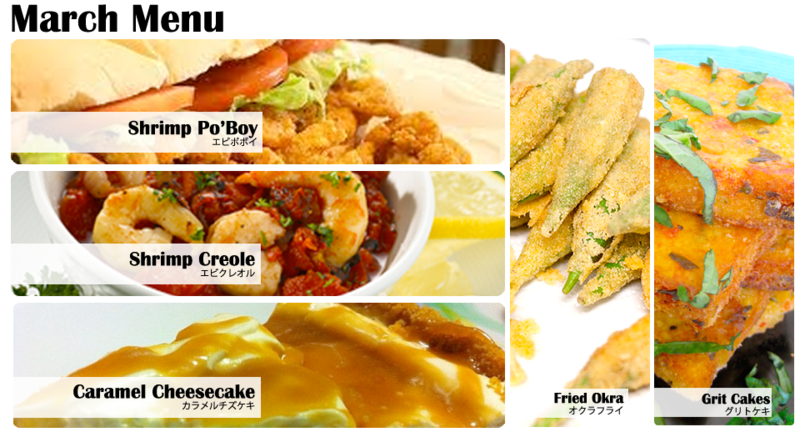 Also, Fried Okra is extremely popular in America and it is here in Japan, too. 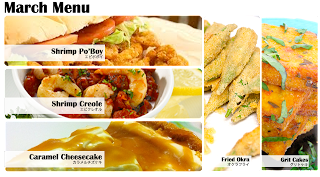 Instead of having small cuts of it, we decided to make them more like Okra fries or sticks, so they go together nicely with the Po'Boy. The Cheesecake is a desert that I like, but we make it look more like a tart to reduce the amount of sugar for the Japanese palate as well as to reduce the the cooking time so as to fit the 4hour cooking class slot.